Take Control of your split system air-conditioning costs. Standard remote controllers for split system Air Conditioning units have a wide temperature operating band, which can be from 18°C to 30°C. Frequently, people set the temperature to more extreme levels than needed. For instance, on a hot day a hospitality guest may set the A/C in their room to 18°C. The temperature set-point has a significant impact on how much electricity is used. Every 1 degree of additional heating or cooling increases electricity consumption by approximately 10%. Driving the A/C equipment harder also diminishes it’s lifespan considerably. An Energy Saving Remote Controller is a simple device that is effective at reducing split system A/C costs. It has a built-in feature the manufacturer remotes don’t have, ‘Temperature range presets’. 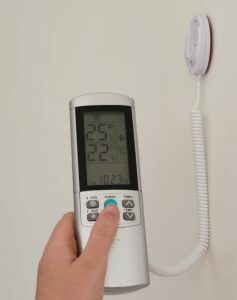 The energy-saving remote is programmed to control any split system unit within your predetermined set-point range (22°C to 24°C for example). Occupants are able to control the air-conditioner only within the range you set. This eliminates operation at the extreme limits of the split system and results in energy and financial savings, quieter operation, less maintenance and increased equipment longevity. Energy savings of approximately 10% are achieved for every 1°C the temperature setpoint is increased. The energy saving remote does not interfere with the running of the split system air conditioning units and is compatible with all existing major brands. The product comes with a 12-month warranty. Over 80,000 energy saving remotes have been installed in Australia, demonstrating reliability over many years. They are effective for energy savings in businesses such as hotels, resorts, caravan parks, mining camps and schools. Please contact us to find out how the air conditioning energy saving remotes may benefit your business.